I have been weaving for the past few days (whoo hoo!). I am making cloth for my next batch of hand bound books. In the face of a million possibilities I decided to stick with something traditional. So, I picked a few miniature overshot designs with names I thought might be appealing and/or seasonal, such as Young Lovers’ Knot and Star of Bethlehem, did some math, wound a warp, dressed my loom, and got to work. I decided to start with the Young Lovers’ Knot. (Actually, I don’t know if it’s one lover or more than one for that apostrophe.) My warp is black 20/2 cotton which I picked because I wanted the scale of the pattern to be proportionate to the size of the books. Well, it is delicate and pretty, but in retrospect my choice of yarn was crazy since it is taking forever to weave. For the tabby I’ve been using the same 20/2 black as the warp, and for the pattern I picked red in 10/2 cotton, thinking lovers, drama, passion…. Anyway, the point is, the second repeat of the design looked very different from the first and I though I had made a mistake. “Hmm. Weird. Haven’t woven overshot in a while, must be rusty.” I checked my treadling carefully and everything was accurate. I used my trusty angle-measuring tool, set at 45 degrees, and my beat wasn’t consistent between the repeats; one repeat was more square than the other. I figured my beat was the problem, and that I would settle into a rhythm after a while. So I kept going, and finished up the red section. The problem didn’t go away. 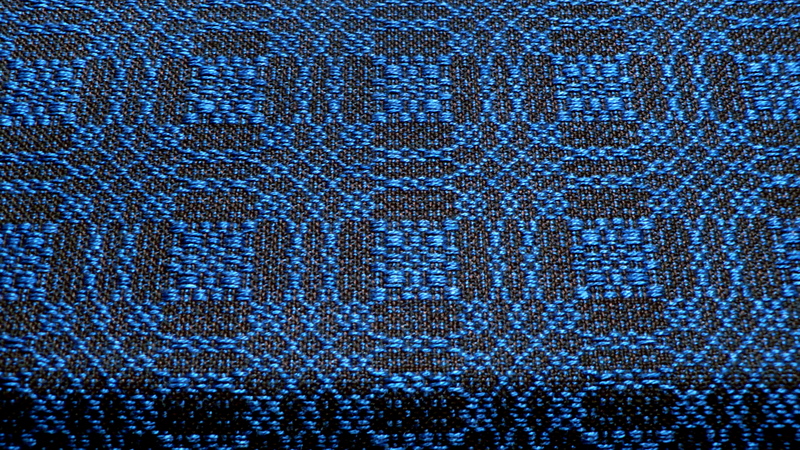 I didn’t mind the alternating look between pattern repeats because it was consistent and kind of rhythmical. In fact, I liked the little daisies in the corners of the less compact version of the pattern. Daisies, diamonds, daisies, diamonds. Not too bad. I decided to switch colors and yarns. For the new pattern yarn I picked 10/2 tencel in a bright green. Shiny, vibrant, almost neon… passion of a different sort. But same thing after two more repeats: they looked distinctly different, but again I checked and confirmed I had not made a treadling error. Why did it keep happening the same way each time? It would be an unlikely coincidence if I kept making the same mistake in the same place in the pattern each time. Then I remembered: emboldening tabby! Clearly that was my problem, but since it was happening on a nice, regular basis, it wasn’t really an eyesore. Maybe I didn’t really need to fix it. However, it kept bugging me because I knew how to solve the problem. Overshot is a weave structure where the pattern is created with long weft floats. They would be too unstable to be useful unless you secured the floats to a stable background. To make a stable background, you weave a pick (or row) of plain weave between each pick of pattern weft. Typically the plain weave thread is the same yarn as the warp, and the pattern weft is much thicker. Plain weave is a very stable weave structure because it has the maximum number of intersections of vertical (warp) and horizontal (weft) threads. For some reason that I’ve always meant to look up, plain weave is also called tabby, especially when it’s used in this way to alternate with pattern wefts. Plain weave is made up of two alternating sheds: usually all the odd numbered shafts or harnesses work together, and all the even ones work together, and they alternate. They are sometimes called tabby a and tabby b to tell them apart. For overshot, you weave one row of pattern, then tabby a, the second row of pattern, then tabby b, the third row of pattern, back to tabby a, and so on. Depending on your overshot pattern, one tabby tends to push the pattern weft floats apart, and the other tends to let them squeeze together. The pushy one can make the pattern pixelated, slightly elongated, or hard to see. The squeezy one helps the pattern pull together and look compact and distinct. The proper term for the squeezy tabby is “emboldening tabby.” You want the emboldening tabby. I was only getting the emboldening tabby on every other pattern repeat. Rats. 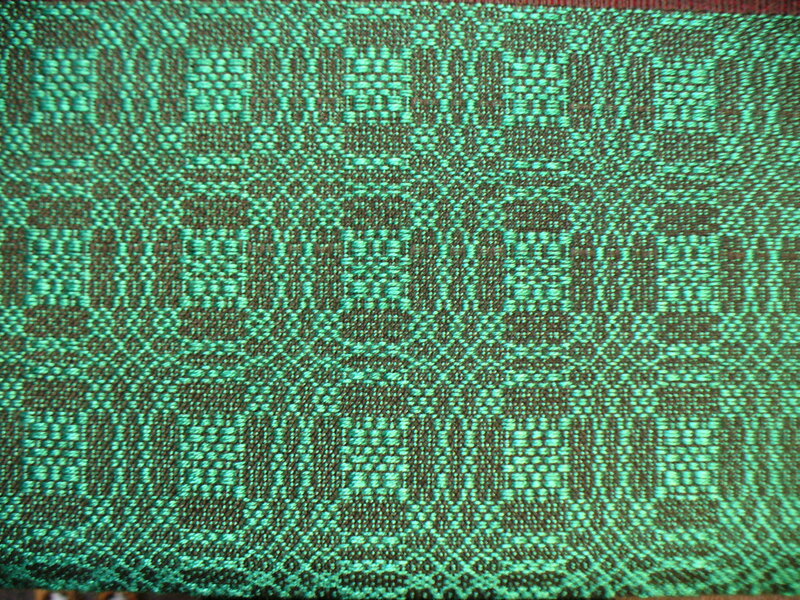 After weaving the green section I decided, for the sake of consistency and for the sake of my good name as a master weaver, to fix it. So, I counted the number of picks in the pattern repeat… an odd number. That meant that every time I started the pattern again, I was on the opposite tabby. You can add or subtract a row from the pattern to get an even number of picks in the pattern, which will fix this problem. 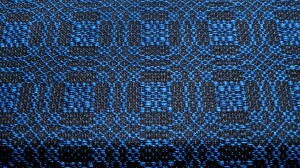 Where you add or subtract the row, of course, changes the look of the pattern slightly. Also, the problem wasn’t at the “turning point” in the middle of the pattern (it’s symmetrical) because the top and bottom of each repeat were consistent; the problem happened between the repeats. So I decided to add a pattern pick at the end of the pattern each time. Ta Da! Consistent emboldening tabby. It no longer bugs me. Emboldening tabby alternates. Compare the middle row with the upper and lower rows. The middle row has the emboldening tabby. If you look in the denser, square sections of the motif (OK they’re rectangular), the places with four little lines in a row should make a small box with no gaps between the rows. In the bottom and top rows of the pattern, there’s a gap between the four identical rows, so they are separated into two rows of two lines. It doesn’t look terrible, right? But it’s not considered ideal. 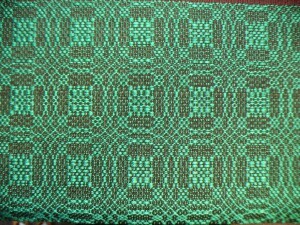 Below (different color weft) the emboldening tabby is consistent in each repeat of the pattern. In the circumscribed squares, the areas where four identical rows occur look the same from one repeat of pattern to the next. Emboldening tabby is consistent between pattern repeats. Having been a little bit obsessed with flax lately, I have really enjoyed reading it. I have been amazed and inspired by the hours of labor and creative energy that went into each piece, the care with which the pieces were saved by the families who inherited them, and the effort that Ms. Gallagher put into the study. Eventually this collection became part of the Smithsonian Division of Textiles in Washington D.C. The author herself inspires awe, being a Master Weaver who, according to the blurb on the book jacket, “combined marriage and a career in bacteriology and various types of medical research,” along with motherhood. Her fine linen pieces won awards at NEWS (which I attended for the first time this summer!). I have also found the stories about the weavers and their families touching and inspiring. One weaver whose story especially captivated me is Thankful Barron Taylor (1801-1896). Thankful lived in Washington, Vermont. By the way, she is not the Thankful Taylor from Tennessee who was famous for having a snake in her belly. And also by the way, Thankful Barron Taylor’s mother was from our fair city, Amherst, MA. Here I’m picturing a needlepoint or crewel work periodic table, and I want one. “The study of botany, zoology and biology, with the aid of a microscope, have been pursued with avidity.” This in addition to raising a family and all the daily labors of a household. She earned $12 (which must have been a lot of cash in those days) to buy a dictionary by spinning yarn for several weeks. OK, I’m sure this account is romanticized, but I still love Thankful Barron Taylor. Her pieces in the collection include a point twill and two 5 harness spot Bronson designs. She lived to the ripe old age of 95; December 17th, 2011 will mark the 115th anniversary of her death. Thank you, Thankful!